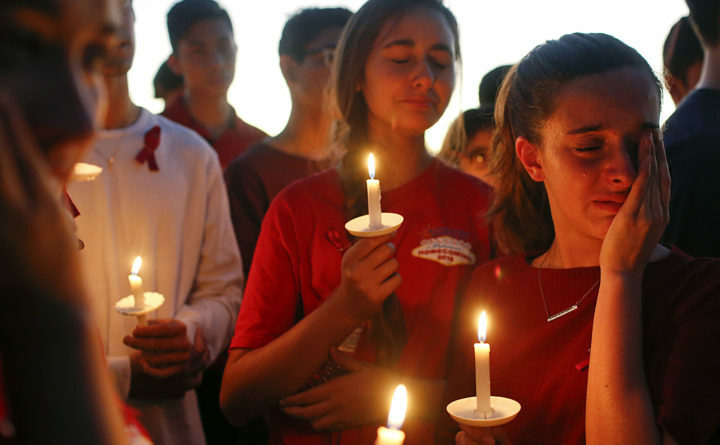 Students gather to grieve during a vigil at Pine Trails Park for the victims of a shooting at Marjory Stoneman Douglas High School, in Parkland, Florida, Feb. 15, 2018. Over 18 months before the shooting at our school, 49 people were killed at the Pulse Nightclub in Orlando. Four months before Parkland, 58 people were killed at a concert in Las Vegas. And just last month, 11 people were killed at Tree of Life synagogue in Pittsburgh. In all that time, not a single federal law has been passed that addresses gun violence. Not a single law. Our nation’s leaders have failed to protect citizens where they live, where they learn and where they pray. On March 24, we and 22 fellow students organized March for Our Lives, the largest mobilization of young people this country has ever seen. Millions joined us for rallies in Washington, D.C., and in other cities and towns across the nation. Since then, we’ve traveled to over a hundred communities to talk about common-sense reform. Our tour took us to deeply conservative parts of the country, where people staunchly disagreed with us. When we visited Bismarck, North Dakota, the mayor and state representative arrived at our town hall meeting to lead a counter-rally right outside. Other times, people have shown up at our events armed to the teeth, shouting our names and accusing us of being “crisis actors.” We’ve gone out to meet them. We’ve explained that we’re not the gun-grabbing communists they think we are — that when people advocated for safer roads and cars, they weren’t anti-vehicle. We’re just trying to keep people from dying. Sometimes, the people we talk to end up in tears. Usually, we end up finding common ground. The gun debate has begun to shift. National Rifle Association spending for 2018 is down 90 percent from 2014, and Reuters reports that gun-control groups have outspent gun rights groups by 40 percent in the midterms, “unraveling the NRA’s longstanding dominance in spending on gun politics.” Once considered too polarizing to touch, gun control has become a major campaign theme for gubernatorial races in Ohio and Florida, congressional races in Virginia and Nevada and the Senate race in Texas. A recent study notes that young Americans — called the “Columbine Generation” — rank school shootings as the top issue facing America’s future. On Election Day, we can turn that conviction into lasting change. When young people are told to vote, it’s often from an outside, almost parental, perspective — it’s a lecture about their civic responsibility, as if casting a ballot is some chore they’ve forgotten. But for the past month, we’ve visited college campuses across the country, walking up to strangers who don’t recognize us or know our story, and talking to them as peers. We tell them what they already know: Politicians don’t care about young people. (In a country where students are saddled with massive debt and have to live in fear of getting shot in their classrooms, they don’t usually take much convincing.) Then we talk about why: It’s because young people don’t vote. On Nov. 6, we can change that. We can make our democracy truly representative, ideologically and demographically. David Hogg and Emma Gonzalez are student activists and survivors of the Marjory Stoneman Douglas High School shooting on Feb. 14, 2018.